New season style isn’t just restricted to your wardrobe. 1. They have a host of exclusive brands, including cult classics Charlotte Tilsbury, MAC and Tom Ford. 2. It’s home to 10,000 beauty products. To break it down: That’s 50 international brands, 3,500 of these products are award-winners and 125 complimentary services are available in store. 3. ‘A Galaxy of Beauty Event’ is their jam-packed events calendar, filled with top tips from the pros, visiting makeup artists lasting 18 days. 4. They’re the first company in Ireland to introduce a Beauty Personal Shopper, Warren Dowdall. He’s an industry expert having worked for YSL and Bobbi Brown and with Brown Thomas for the last seven years. And he's amazing. 5. It offers complimentary consultations for cancer patients in a private suite. Warren will give advice about their beauty and skincare regime during their time of illness. 6. Brides-to-be will be in heaven with a personal consultation giving them their need-to-know beauty advice before their big day. 7. It’s not just limited to makeup. Get a ‘hair over’ with styling, tips and tricks at Aveda. 8. 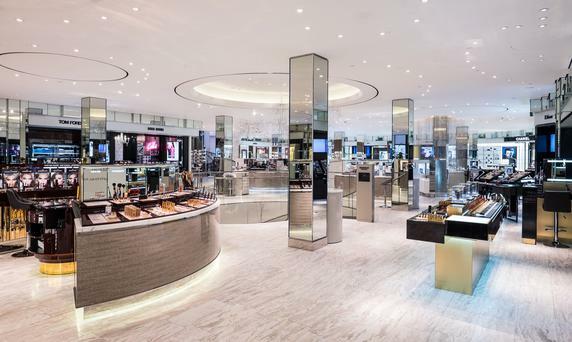 It’s a new hub for celebrity style with Irish makeup stars Billy Orr (of Rihanna and Lady Gaga fame), Paula Callan and Derrick Carberry hosting events at Brown Thomas’ around the country. 9. The freebies: In addition to your exclusive tips on boosting your beauty regime, there’s free products at events, in store and money-can’t-buy prizes. 10. It’s an A-list destination for stars here and abroad - Rihanna (again), Victoria Beckham and most famous Irish faces are well versed in their array of lotions and potions. As one of Hollywood's most beautiful actresses, it's safe to say Jessica Alba has a few beauty tricks up her sleeve. Triona McCarthy Creme de la Mer is always worth every penny and now, I've found a new love. Brown Thomas' Beauty Personal Shopper Warren Dowdall shows us how to correct and conceal in three easy steps. Makeup artist Paula Callan shows what every woman in her twenties should have in her makeup arsenal.